This past weekend Kobe Bryant passed Michael Jordan for third on the career NBA points scoring leaderboard. While perhaps he has never quite been the player MJ was, his resume is undeniably impressive and he will go down as an all-time great. However, what are the chances that Kobe goes all the way and ends his career with the most points in NBA history? Ahead of him now lie only Karl Malone with 36,928 and Kareem Abdul-Jabbar with a resounding 38,387 career points. Under the assumption that Kobe retires after next season as Mitch Kupchak suggested, Kevin Pelton found that he had little chance of ever even catching the Mailman. However, given Kobe’s astonishing resilience and desire to keep playing (and shooting), if he gets in range he could give it a shot. If we relax that assumption, we can dig up Bill James’ favorite toy to estimate the probability that he passes either player, and indeed try to consider what would have been had he not fallen injured last season. 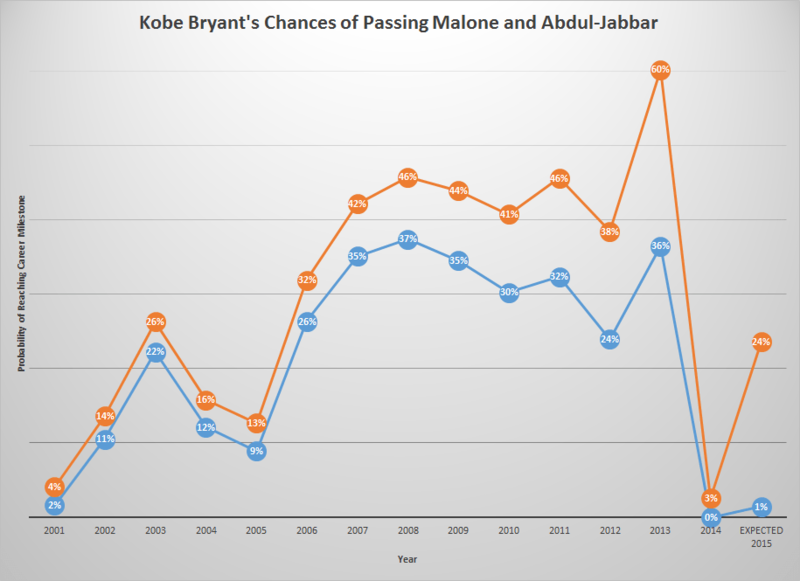 The graph below shows his past probabilities of passing Abdul-Jabbar (in blue) and Malone (in orange) in October of the year on the x-axis (i.e. before the season starts). The numbers shown for 2015 assume he keeps up his current rate of production for the rest of the season. Before last year’s fateful injury, Kobe had a real shot at Abdul-Jabbar’s crown. His chances were as high as they had been since his 2007-08 MVP season and had been in the solid mid-30s for the past few years. He was also likely to pass Malone, having come within 5,311 points of his total in relative health. The lost injury season killed him, crushing his chances of catching either player. However, this season Kobe has played like a man possessed. It is unclear if it’s actually hurting the Lakers, but Kobe is second in the league in usage percentage despite barely cracking the top 50 in PER. It is probably unrealistic to assume he will keep up this pace (he has already slowed slightly after Nick Young’s return) but if he does, the model gives him a shot at getting past Malone. 24% may not be a lot, but it could be enough to convince Kobe to keep playing beyond next season. So while Abdul-Jabbar is likely forever out of reach, Kobe’s rise up the leaderboard may not stop here. I’m all in on Kobe shooting 40 shots a game as the Lakers tank (taking advice from Magic Johnson) to keep their top five pick. Who’s against seeing another 81 point game?